Be the first to share your favorite memory, photo or story of Matt. This memorial page is dedicated for family, friends and future generations to celebrate the life of their loved one. 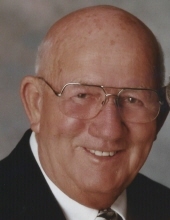 Matthew Lagerwey went home to be with the Lord Monday, April 1, 2019. He was born to parents Johannes & Adriana February 3, 1930. His parents emigrated from Holland and settled in Shepherd, Yellowstone County Montana where he was born. He was the youngest son born the thirteen of fourteen children. The family soon moved to Lynden and he graduated from Lynden High class of 1948. He married Caroline Schouten in 1950. They parented five children Ron, Marv, Matthew Douglas, Darrel and Kathy. They were married for fifty two years until they were parted by the death of his wife in 2002. He was also preceded in death by his third son and namesake Matthew Douglas in 2007. His passion and vocation was carpentry. He worked construction, built numerous homes in the Lynden area and built cabinets for homes. During his retirement years he built childrens furniture and hope chests among many other things. His wood creations were imaginative and skillfully built. He was active in the Nooksack Reformed Church serving as both elder and deacon. In 1992 he ran and won the City of Everson's Mayoral race. Serving as Mayor of Everson for eight years. He remarried in 2003 to Shirley Strotz. He adored his grandchildren and enjoyed watching them play house with his handmade childrens furniture. Many of his brothers and sisters settled in Whatcom County and they remained very close throughout their lives. The family grew so large they had to rent the Lynden Fairgrounds to hold their family reunions. He will be missed by all who knew him. Funeral services will be held this coming Friday April 5. The Graveside service will be held at Nooksack Cemetery at 10 a.m. followed by a Memorial service at Nooksack Valley Reformed Church at 11 a.m. Funeral arrangements are entrusted to Gillies Funeral Home and Cremation Services. To send flowers or a remembrance gift to the family of Matt Lagerwey, please visit our Tribute Store. "Email Address" would like to share the life celebration of Matt Lagerwey. Click on the "link" to go to share a favorite memory or leave a condolence message for the family.